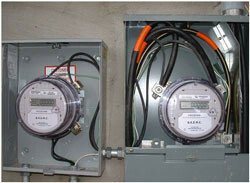 Requires a 2nd-meter socket be added adjacent to the existing meter socket, and the renewable system interconnection point is located at the “line” (upstream) side of the existing metering point. This enables all of the kWhs produced by the renewable system to be placed on the electric grid. Approved renewable systems up to 100 kW in size are eligible for the Net Billing rate. The renewable energy kWhs are delivered through the existing metering point/meter and enable any “excess” kWhs to flow back on the electric grid. 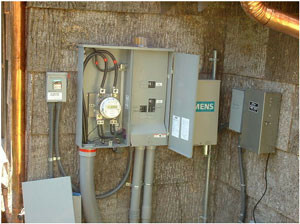 Approved systems up to 25 kW in size are eligible for the Net Metering rate. Inverters must be UL 1741 listed and labeled as “Utility Interactive.” Also, a manual AC disconnect switch must be mounted within 5 feet of the meter base. Prior to submitting your application for interconnection, verify your system’s permitting and inspection requirements with local governmental agencies having oversight and jurisdiction at your location. they are used throughout all the documents.